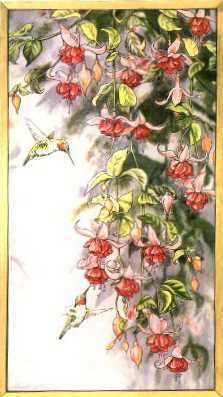 The delicate beauty of the hummingbird is enhanced by the graceful petals of the fuchsia as the birds quickly flit from blossom to blossom, gathering the nectar and small insects that make up their diet. The hummingbird eats up to twice his weight each day to support his extremely high metabolism. At night, the birds go into a deep sleep, lowering their metabolism and subsequently their temperature, sometimes as low as the air temperature around them. Although over 300 species of hummingbirds are found in the western hemisphere, only 7 species breed in North America. Their life span is just a short 10 years, which makes spotting one of these dainty lively creatures a special occasion. The play of light lends energy and elegance to the stained glass tableau.